TRIVIA of Noh : Q121 : How do you hang the big bell for “Dojoji”? | Home | Trivia | Q121 : How do you hang the big bell for “Dojoji”? How do you hang the big bell for “Dōjōji”? “Dōjōji” is one of the great noh plays. 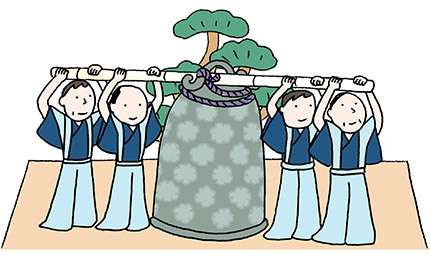 A large bell is brought on by several (usually four) kyōgen actors, then hung and taken down by five noh actors. The bell is often viewed as playing a central role in the play. The kyōgen actors use a thick stick of bamboo placed through the crown of the bell to carry it to the centre of the stage. Two of them unwind the rope around the bell and tie this to the crown. The bamboo stick is then used to put the rope through a pulley on the ceiling. Lead actors are responsible for hoisting the bell, which weighs between 70 kg and nearly 100 kg, depending on the school. Two of them pull up the bell, each supported by a second actor standing behind him. Another actor, known as the tsunasabaki (rope manipulator), ties the rope to a link on the upper right pillar. The actions of the actors can vary slightly in different schools. In the Kanze and Hōshō schools, the bell is brought on just after the musicians come on stage before the start of the play. In the Konparu, Kongō and Kita schools, a supporting actor orders kyōgen actors to hang the bell in a particular scene and they then bring it to the stage. It may be interesting to appreciate the difference of productions between schools.